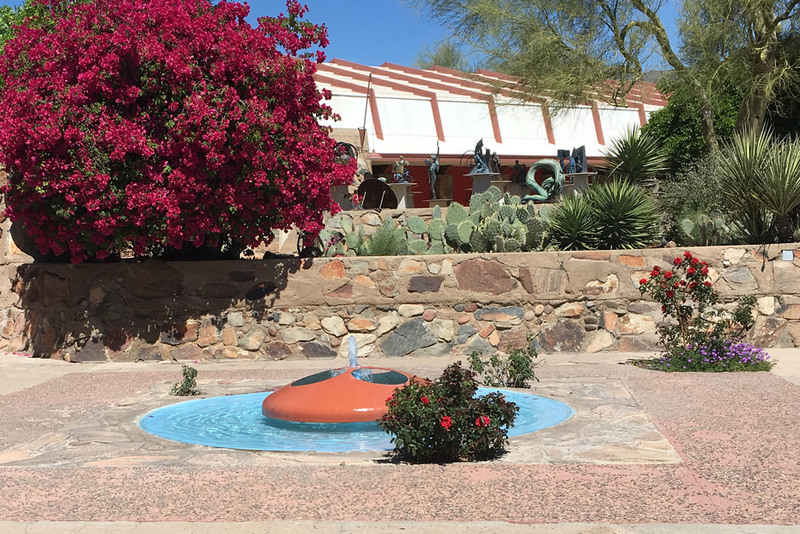 I recently had the opportunity to visit Taliesin West — Frank Lloyd Wright's winter home, architecture school, and ode to the Scottsdale Arizona landscape. We were passing through the area as part of a family vacation, and the majority of our days were spent in nature – at the Grand Canyon and among the striking red rocks of Sedona – or decompressing by the pool. Nothing to complain about with that itinerary! But one morning, my 11 year old daughter and I carved out a couple of hours for a quick visit to this icon of architecture and design. Although our tour was not marketed to children, I was pleasantly surprised by how accessible and inspiring it was for my daughter. I would highly recommend it, particularly for older children and younger teens. From the moment we entered the property, my daughter took over my phone, using the camera to explore and interpret. Upon returning to the hotel later that afternoon, she reported to my husband that her favorite part of the tour was seeing how the buildings connected to nature. Mr. Wright would be proud! And so am I. Here is a very, very small sample of the dozens of photos she snapped during our visit. Wright's principle of exploding the rectangle, keeping the eye busy with intersections and diverse planes, captured succinctly in this image of the rear courtyard. Wright diffused the abundant natural light of the desert throughout the property. He also championed indirect electrical light with the design of early wall and and ceiling sconces. Plentiful and large window-scapes combined with strategic overhangs and locally sourced materials connect the outside and inside areas, while providing respite from the strong sun. The open shelves in Wright's personal space connect directly to the architecture and material palette of the walls (built from stone gathered on and around the property). If you're reading this post real-time (May 2016), and are visiting the Scottsdale area, visit Taliesin West, then add the May 21st Dwell Home Tour to your schedule. I'm sure you'll see the roots of Taliesin West in the five Scottsdale area modern homes Dwell has selected for the self guided tour day. Travels around the world and within my city inspire everything I do. While the details of most of my travels are private, occasionally I share a few travel reflections on my blog. Here's another post highlighting the connection between architecture, design, and the local environment in Sydney, Australia. Happy travels!